On the upcoming holiday (only two more days of work!) 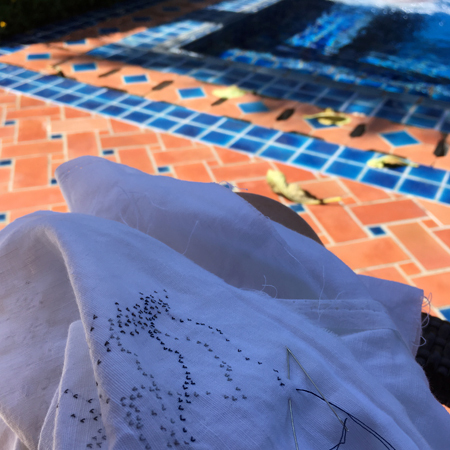 I hope to make a little more progress on that embroidery. 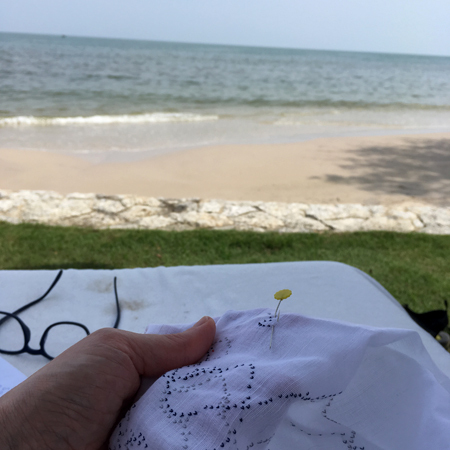 I took it along with me to Thailand and had a quite lovely time stitching away by the pool and the beach. And some nice chats with interested fellow loungers – though explaining it is so soppy that I cringe a little (own your sappiness, lady!). The surrounds won’t be quite so tropical on this trip so the backgrounds are likely to be scarves, coats and fireplaces. In retrospect I rather wish the little hearts had been little kisses, but I’m disinclined to start over having come so far!